The Bovanenkovo oil and gas condensate field developed by Gazprom is the biggest on the Yamal Peninsula. We have a good day today, filled with positive events. We continue developing Russia’s pipeline transportation system. I believe that not only professionals but also people perhaps far from the energy sector are well aware that the facilities we are launching today are not just pipelines, but complicated, large-scale industrial facilities. Let me add that we are bringing online today three large industrial facilities – the Zapolyarye-Purpe and Kuyumba-Taishet oil pipelines and the second leg of the Bovanenkovo-Ukhta gas pipeline. Their launch will substantially expand our oil and gas sector’s possibilities and will have tangible benefits for the entire Russian economy. This is indisputable. What is particularly important is that they will contribute to the regions’ development as well. I would like to thank everyone who took part in these important, large-scale projects. Obviously, as we all know, the work was carried out in difficult, if not severe natural and climatic conditions. New technological and technical solutions were used in the construction process, our most advanced Russian-made equipment was used, and the projects meet the strictest environmental standards and comply with all environmental norms. Overall, these projects were carried out to the highest professional standards. I hope very much that you and your teams will continue to work just as responsibly and with the same positive results. There is still a lot of work ahead. Transneft has projects to build the second legs of these new facilities. There are also plans ahead to develop and bring into operation promising new oil and gas fields, continue developing a modern pipeline system and concentrate on establishing high-tech refining and processing facilities. Comprehensive resolution of these tasks is decisive for strengthening Russia’s energy security and continuing the work to connect all regions to the gas network. Of course, it will also contribute to reliable, guaranteed compliance with commitments under export contracts. Let me conclude by thanking once again the large teams of Gazprom and Transneft for their work. I would like to congratulate you on your achievements. I wish you good health and success. I hope that your teams will efficiently resolve the immediate and mid-term tasks facing them. I give the floor to Chairman of the Gazprom Management Committee Alexei Miller. Mr. President, we are speaking today from the Bovanenkovo field gas compressor center, at latitude 70 degrees North. The launch of new capacity at the Bovanenkovo field at our new gas production base in Yamal, and of the mainline Bovanenkovo-Ukhta 2 gas pipeline play a crucial part in developing Russia’s gas sector over the coming decades. The Bovanenkovo field’s reserves come to 4.9 trillion cubic meters of gas. The project for the field’s development has made provisions for its operation until 2087, over the next 70 years. Today, we are bringing on two 160-megawatt booster stations and 88 development wells. The Bovanenkovo-Ukhta 2 mainline gas pipeline is 1,265 kilometers long. This was one of the biggest and most complex gas transportation projects in the Russian gas sector’s history. More than 450 kilometers of gas pipeline were laid in the harsh natural and geological conditions of the Far North. At the same time, this pipeline is one of the most modern mainline gas pipelines in the world. It was built in compliance with the most stringent environmental and technical demands and was designed for a working pressure of 120 atmospheres. The launch of these new facilities today will make it possible to deliver 264 million cubic meters of Yamal gas a day into the country’s unified gas network. Also very important is that the development of the Yamal gas producing center and expansion of the northern gas transport corridor will change the gas supply flows to consumers in Russia and on the export markets. The northern gas transportation corridor will become the main supply route for shipping gas to regions in European Russia, getting more locations connected to the gas supply network and boosting socioeconomic development. At the same time, the Bovanenkovo-Ukhta 2 gas pipeline and the northern gas transportation corridor are part of the new export route taking Russian gas to Europe from Yamal across the Baltic Sea to Germany using the Nord Stream 2 project, which is progressing according to schedule. Mr. President, I suggest we watch this brief presentation of the new projects. Mr. President, we have the Gazprom Transgaz Ukhta dispatch center on the line. They are the ones responsible for operating the Bovanenkovo-Ukhta and Bovanenkovo-Ukhta 2 mainline gas pipelines. I would like the dispatch center duty operator to report on the pipeline’s work. Head of the dispatch service Ivan Kaplin reporting. All systems are working as normal. Pressure in the pipelines is 120 atmospheres, and gas is coming through at a rate of 264 million cubic meters a day. Mr. President, delivery of Yamal gas to the Bovanenkovo-Ukhta 2 mainline gas pipeline has begun. Mr. Tokarev, you have the floor. 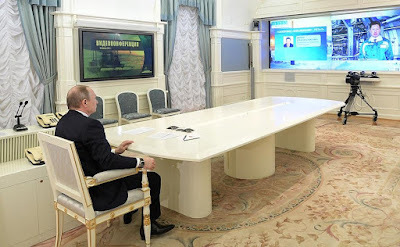 I am speaking from the Transneft central dispatch office, and we have on the line the oil pumping stations and control centers of the Zapolyarye-Purpe and Kuyumba-Taishet oil pipelines. In accordance with the Government resolution, Transneft has completed these two major oil pipeline projects – the Zapolyarye-Purpe and Kuyumba-Taishet pipelines. Essentially, the Zapolyarye-Purpe pipeline is the final stage in the unified Zapolyarye-Purpe-Samotlor oil pipeline system, which is almost 1,000 kilometres long. The Zapolyarye-Purpe pipeline really is unique in that it was built in extreme climatic conditions and there was no previous experience in the world of building such facilities in these conditions. More than 8,000 specialists took part in the project and more than 4,000 pieces of heavy machinery were engaged. We used only Russian-made equipment. The group of specialists at Transneft who developed the engineering and technical solutions used in the project were awarded the State Prize by the Government, and 22 of their developments have received international patents. We have resolved important production tasks and opened up access for the oil workers to rich oil fields, and at the same time, we also took care of social issues. We built 16,000 square meters of housing, created 1,500 new jobs, built 7 bridges, and energy facilities, while budgets at different levels have received around 3 billion in taxes. Along with the Zapolyarye-Purpe pipeline, the Kuyumba-Taishet is becoming equally important because it opens access for the oil producers to a rich oil production region. We have created 800 new jobs and built 11,000 square meters of housing, social infrastructure facilities such as hospitals, schools, kindergartens and sports facilities, and energy sector facilities. The project has brought 1.5 billion rubles in tax revenue to the budgets at different levels. 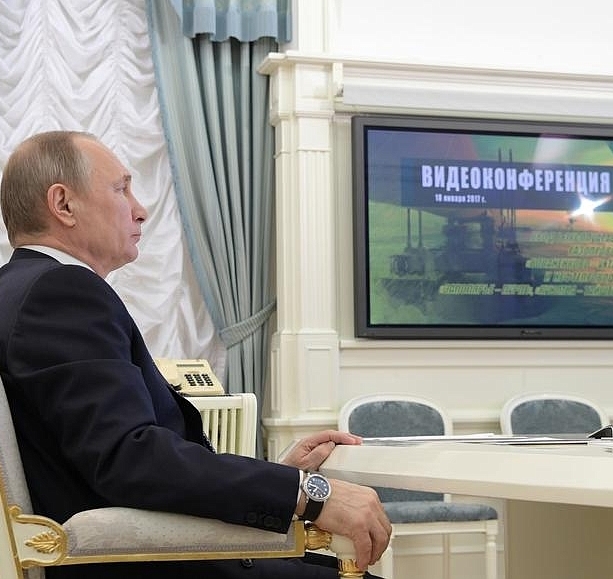 Mr. President, I would like to present a brief video on the Kuyumba-Taishet and Zapolyarye-Purpe projects. Mr. President, with your permission, we will check readiness and launch the oil pipeline’s operation. Transneft-Siberia, is the oil pipeline ready to begin operation? General Director of Transneft-Siberia Viktor Bronnikov reporting. We are at the mainline oil pumping station on the Zapolyarye-Purpe oil pipeline, located in the Yamal-Nenets Autonomous District. Construction of the mainline oil pipeline’s facilities has been completed. Oil is in the system and comprehensive test runs have been conducted. We have received the permits for operation to begin. The Zapolyarye-Purpe mainline oil pipeline is ready to start operation. Operator of the Zapolyarye main oil pumping station, launch the oil pipeline’s operation. Operator of the Purpe oil pumping station, report on oil coming into the tank farm. Dispatcher: This is Purpe oil pumping station on the line. The oil pipeline has started operation. The parameters are normal. Oil is coming into the Purpe oil reservoirs. Transneft-Vostok, is the oil pipeline ready to start operation? General Director of Transneft-Vostok Alexander Puzikov reporting. I am speaking from mainline oil pumping station No 2 on the Kuyumba-Taishet pipeline, located in Krasnoyarsk Territory. Construction of the mainline oil pipeline’s facilities has been completed. Oil is in the system and comprehensive test runs have been conducted. We have received the permits for operation to begin. The Kuyumba-Taishet mainline oil pipeline is ready to start operation. Operator at oil pumping station No 2, start the oil pipeline. Operator at Taishet oil pumping station, report on oil coming into the reservoirs. This is oil pumping station Taishet on the line. The oil pipeline has started operation. The parameters are normal. Oil is coming into the reservoirs. Colleagues, a Government resolution on Gazprom was approved in 2009 and on Transneft in 2012. We are well aware of what is happening on the global energy markets. However, we all see clearly that energy demand will grow, both in Russia as the economy develops, and around the world, and this will increase demand for hydrocarbon resources. In order to be ready for the market’s expansion, we need to take timely investment decisions, as we did for these projects. As we see, it took 7 years to carry out one project and 4–5 years to complete the other. In our future planning, we therefore need to be very careful not only about responding to events on the global energy markets, but also about keeping up with developments in our own economy so as to avoid any future bottlenecks due to insufficient energy resources or lack of necessary infrastructure. I congratulate you on today’s events and I hope that your companies’ plans will meet these demands and that we will see timely decisions taken in coordination with the Government. I congratulate you all and your teams, and wish you further success. President Putin via videoconference launched new gas and oil pipelines. 0 Comment to "Putin launched Bovanenkovo-Ukhta 2 gas pipeline"